Whether coding is your daily business, or just your hobby, chances are you've encountered a problem which has already been solved by other developers. For you, the internet is an infinite source for tutorials, solutions, forums and code snippets that help you with your work. But how do you keep the solutions to your coding problems and get rid off all the things around it that you don't need? And how do you ensure that the pieces of code you've found can quickly be found again? 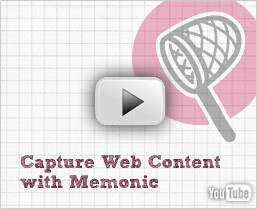 With Memonic, you can easily save those pieces of code or articles that you need. With just one click, the desired part of a website is saved in your personal online notebook, and ready and accessible for you anywhere and anytime. Content does not expire and is searchable by any keywords. Save what you want, organize it the way it fits your workflow and share it among your fellow programmers through any channel. Never lose a piece of code, a tutorial or a forum thread again! Memonic offers you a timely solution to keep everything needed to get your next project in one place!